Parker, A. and Ollier, C.D. 2017. 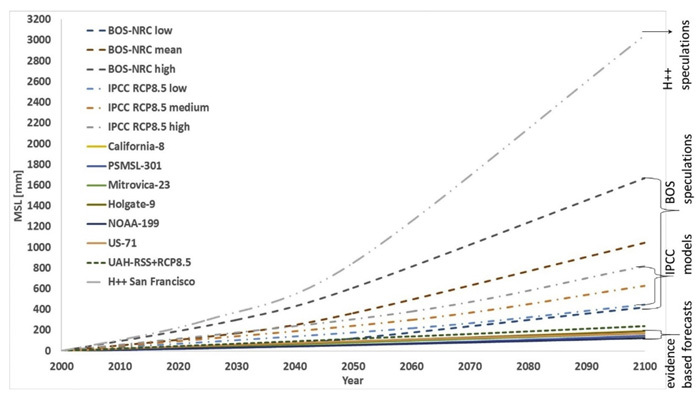 California sea level rise: Evidence based forecasts vs. model predictions. Ocean & Coastal Management 149: 198-209. In providing the background for their most recent paper on the potential future impacts of climate change on sea level rise, Parker and Ollier (2017) write that "the extreme predictions of the Intergovernmental Panel on Climate Change (IPCC) have been the inspiration of hundreds of papers by local panels proposing ever-increasing alarming messages [and adaptation strategies]" that originate from "purely theoretical studies based on sea level-predictions by non-validated models." Attempting to inject some sanity back into this aspect of the global warming debate, the two Australian scientists set out to "compare model predictions and projections with evidence-based forecasts to discuss the likelihood of the extreme sea level rise scenarios." This task involved analyzing multiple sources of sea level rise projections and measurement data for the California coast, which was their region of focus given that recent "studies" have suggested future sea levels could well rise between 0.4 and 3 meters by the year 2100. And what did the two researchers learn from their study? As shown in the figure below, Parker and Ollier determined that trend extrapolations from the best available tide gauge data sets fall far short of sea level rise predictions made by the IPCC, the National Research Council (2012) and the California Ocean Science Trust (Griggs et al., 2017). Whereas empirically-based data trends suggest a future increase in mean sea level of between 100-200 mm by the year 2100, the model-based projections estimate future sea levels will rise by 400 to as much as 3100 mm. Thus, they correctly report that "the factual measurements are all well below the modelled estimates." And in demonstrating the sheer absurdity of the model-based projections, the two researchers additionally note that "at present rates of sea level rises and accelerations, the time needed to [reach the National Research Council's high end projections] of sea level rise along the coast of California is 912 years," which would require "a warming of 9.88 °C" based on IPCC sensitivity parameters. In summing up these and other of their several findings, Parker and Ollier write that "the evidences from real sea level measurements do not support the IPCC models or the even more alarming predictions [made by the National Research Council and California Ocean Science Trust]. The latter," they continue, "are founded on pure speculation, constructed on unproven assumptions, and do not provide a suitable basis for use in planning or policy making." Sadly, however, too many misguided politicians and activists are hell-bent on formulating and enforcing policy based on such shoddy science -- if one can even classify such projections as science. We think not! Figure 1. Comparison of sea level rises predicted by a local panel of the National Research Council (BOS), the IPCC (IPPC) and the California Ocean Protection Council Science Advisory Team Working Group (H++), along with forecasts that are inferred from tide gauge measurements of different data sets (California-8, PSMSL-301, Mitrovica-23, Holgate-9, NOAA-199, US-71) and inferred from RSS and UAH satellite global temperature measurements and IPCC AR5 RCP8.5 sensitivity (UAH + RSS + RCP8.5). Source: Parker and Ollier (2017). Griggs, G., Arvai, J., Cayan, D., DeConto, R., Fox, J., Fricker, H.A., Kopp, R.E., Tebaldi, C. and Whiteman, E.A. 2017. Rising Seas in California: an Update on Sea-level Rise Science. California Ocean Protection Council Science Advisory Team Working Group, California Ocean Science Trust. National Research Council. 2012. Sea-Level Rise for the Coasts of California, Oregon, and Washington: Past, Present, and Future. Washington, DC: The National Academies Press. https://doi.org/10.17226/13389.